Objectives To analyse the association between dietary long-chain n-3 polyunsaturated fatty acids (PUFAs) and incidence of rheumatoid arthritis (RA) in middle-aged and older women from the Swedish Mammography Cohort, a population-based prospective study. Methods Data on diet were collected in 1987 and 1997 via a self-administered food-frequency questionnaire (FFQ). The risk of RA associated with dietary long-chain n-3 PUFAs and fish intake was estimated using Cox proportional hazard regression models, adjusted for age, cigarette smoking, alcohol intake, use of aspirin and energy intake. Results Among 32 232 women born 1914–1948, 205 RA cases were identified during a mean follow-up of 7.5 years (1 January 2003 to 31 December 2010; 2 41 120 person-years). An intake of dietary long-chain n-3 PUFAs (FFQ1997) of more than 0.21 g/day (lowest quintile) was associated with a 35% decreased risk of developing RA (multivariable adjusted relative risk (RR) 0.65; 95% CI 0.48 to 0.90) compared with a lower intake. Long-term intake consistently higher than 0.21 g/day (according to both FFQ1987 and FFQ1997) was associated with a 52% (95% CI 29% to 67%) decreased risk. Consistent long-term consumption (FFQ1987 and FFQ1997) of fish ≥1 serving per week compared with<1 was associated with a 29% decrease in risk (RR 0.71; 95% CI 0.48 to 1.04). Conclusions This prospective study of women supports the hypothesis that dietary intake of long-chain n-3 PUFAs may play a role in aetiology of RA. To investigate the association between dietary long-chain n-3 PUFA intake and risk of developing RA, we analysed data from a prospective population-based cohort of middle-aged and older women. We evaluated the association between recent and long-term intake (based on two dietary assessments, one in 1987 and one in 1997) of dietary long-chain n-3 PUFAs and risk of developing RA. The Swedish Mammography Cohort (SMC) is a prospective population-based study including all women born between 1914 and 1948 and living in Uppsala and Västmanland counties who between 1987 and 1990 received and returned a questionnaire by mail regarding diet, height, weight, parity and educational level (response rate 74%). In 1997 a second questionnaire, with additional information on smoking history, physical activity, use of dietary supplements and aspirin, was sent to the 56 030 participating women still alive, and 70% responded (38 984 women). This study was approved by the Regional Research Ethics Board at Karolinska Institutet, and all participants gave their informed consent. As the Outpatient Register was started in 2001 and in the first few years it caught prevalent as well as incident cases as new cases (see online supplementary appendix, figure App-2), we decided the period of follow-up should be 1 January 2003 until 31 December 2010. In sensitivity analyses, we considered delayed starts of follow-up and inclusion of cases identified through hospitalisation (see online supplementary appendix, table A). Moreover, we evaluated the impact on our results of the scenario that 0–20% of the cases identified as newly diagnosed were in fact misdiagnosed prevalent cases and had an exposure pattern that was dissimilar to that of incident cases (see online supplementary appendix, table B). In the main analysis, we excluded from the 1997 SMC all women with a diagnosis of non-RA joint conditions (n=2052, ICD-10 codes M07–M12, M14, M45, M46, M30–M36), women with extreme (ie, 3 SDs from the mean value on the log-transformed scale) energy intake (n=496), and women who died before the start of the follow-up on 1 January 2003 (between 1997 and 31 December 2002; n=1602). We also excluded women with a diagnosis of RA before the start of follow-up (n=435, 1.2%). For the main analysis, we additionally excluded women who consumed fish oil supplements (n=2167, 6.3%), because this information was only qualitative (ever/never use). The final study cohort included 32 232 women aged 54–89 years, of which 205 were identified as newly diagnosed RA cases during the follow-up period. In a sensitivity analysis, we included women who reported use of fish oil supplements in the analysis of the association between dietary long-chain n-3 PUFAs and fish and RA, and the total number of RA cases was then 222 (among 34 399 women). In a second sensitivity analysis, we also considered the exclusion of cancer cases before the start of follow-up (n=2389); the number of RA cases was 192 among 29 843 women. We used a Cox proportional hazards model to estimate the association between dietary long-chain n-3 PUFAs and fish and RA in terms of relative risk (RR) as hazard rate and their 95% CIs. All RRs had age as the time scale,20 ,21 and we calculated age at the end of follow-up as age at first RA diagnosis, at death, or at 31 December 2010, whichever occurred earlier. The multivariable RRs for dietary long-chain n-3 PUFAs were adjusted for cigarette smoking (categorised as never, former, current ≤10 cigarettes/day or >10 cigarettes/day), alcohol intake (never, former, current <2 drinks per week, ≥2 drinks per week), use of aspirin (yes, no) and energy intake (quintiles). The inclusion in the model of years of education (<5, 5–12, >12 years), body mass index (quartiles), total physical activity (quartiles) and intake (quintiles) of linoleic acid, arachidonic acid and α-linolenic acid did not change the estimated RRs by more than 5%; therefore we excluded these variables from the final multivariable-adjusted Cox model. The multivariable RRs for long-term fish consumption were also adjusted for consumption of red meat and dairy food (quartiles). We checked the assumption of hazard proportionality regressing the scaled Schoenfeld's residuals against survival time.22 No evidence of departure from the proportionality assumption was observed in the models. The test for linear trend was performed using the median value of each exposure category. The dose–response trend association between dietary long-chain n-3 PUFAs and risk of RA was estimated using restricted cubic splines with knots at 10, 50 and 90 centiles.23 Statistical analyses were implemented using SAS (V.9.2) and Stata (V.11.1), and p values ≤0.05 were considered significant. During the follow-up period from 1 January 2003 to 31 December 2010 (mean 7.5 years; 241 120 person-years), 205 cases of RA were identified. In the cohort, there was a fourfold difference in the median intake of long-chain n-3 PUFAs between the lowest and highest quintile (table 1). Women in the lowest quintile of dietary long-chain n-3 PUFAs included the highest percentage of current smokers (24%) and the lowest percentage of alcohol drinkers (72.9%) and aspirin users (41.1%). Among the cases, 27% had an intake of dietary long-chain n-3 PUFAs lower or equal to 0.21 g/day (first quintile of the distribution), compared with 20% in the entire cohort. The age-adjusted risk of developing RA had already decreased in the second quintile of dietary long-chain n-3 PUFAs by 39% (RR 0.61; 95% CI 0.40 to 0.93) compared with women in the lowest quintile (table 2). After adjustment for cigarette smoking, alcohol intake, use of aspirin and energy intake, the RR for women in the highest quintile (>0.49 g/day) of long-chain n-3 PUFA intake decreased slightly (RR 0.67; 95% CI 0.44 to 1.03) compared with women in the lowest quintile. After additional adjustment for years of education, body mass index, total physical activity, linoleic acid, arachidonic acid and α-linolenic acid, the RR was 0.67 (95% CI 0.40 to 1.11). The test for linear trend was not statistically significant for age- (p for trend=0.25) and multivariable-adjusted (p for trend=0.30) models, since the inverse association between dietary intake of long-chain n-3 PUFAs was already observed in the second quintile. In the threshold model (comparing quintile 1 vs quintile 2–5), women with an average daily intake of long-chain n-3 PUFAs higher than 0.21 g had a 35% (95% CI 10 to 52%) decreased risk of developing RA compared with women with a daily intake of 0.21 g or lower. The population prevented fraction, the equivalent of the population attributable risk when analysing a protective factor, was 0.28. This indicates that 28% of the hypothetical total load of disease could be prevented by exposure to >0.21 g/day of dietary long-chain n-3 PUFAs. The dose–response relationship between dietary long-chain n-3 PUFAs and RA risk, estimated using restricted cubic splines, showed that the RR was constant for women with an intake of more than 0.35 g/day (median of the distribution), but, below 0.35 g/day, the RR was increased in a dose–response manner and was 1.47 for women who had an intake of 0.1 g/day (95% CI 1.04 to 2.09) (figure 1). Dose–response relative risk (solid line) with 95% CI (short dashed lines) presenting the association between intake of dietary long-chain n-3 polyunsaturated fatty acids and risk of rheumatoid arthritis adjusted for age (continuous), cigarette smoking (never, former, current ≤10 cigarettes/day or >10 cigarettes/day), alcohol intake (never, former, current <2 drinks/week, ≥2 drinks/week), use of aspirin (yes, no), and energy intake (quintiles). 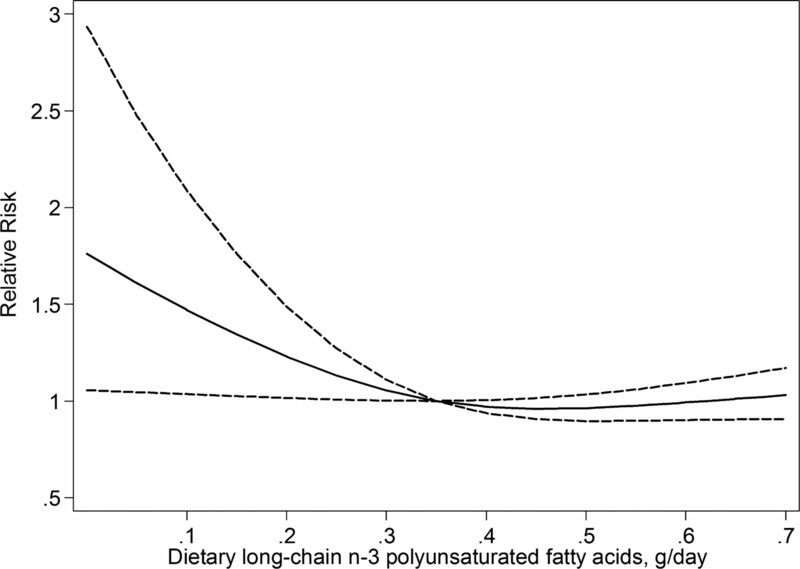 Tick marks represent distribution of cases according to long-chain n-3 polyunsaturated fatty acid intake. A sensitivity analysis based on the SMC including women who used fish oil supplements (6.3% ever users in the whole cohort (n=34 399), 7.7% among cases (n=222)) showed similar results: women in the second quintile of dietary long-chain n-3 PUFAs had a 38% decrease in risk compared with women in the lower quintile (RR 0.62; 95% CI 0.41 to 0.93). Use of fish oil supplements (ever/never) was not statistically significantly associated with development of RA (RR 1.32; 95% CI 0.80 to 2.17). Exclusion of cancer cases before the start of follow-up did not affect the estimates (RR among women with >0.21 g/day of long-chain n-3 PUFAs 0.67; 95% CI 0.48 to 0.92). Results from sensitivity analyses with different starts of follow-up, inclusion of hospitalisation data, and assumptions on the possible inclusion of 0–20% prevalent cases with a different exposure pattern were similar to our main analysis (see online supplementary appendix, tables A and B). Long-term intake of dietary long-chain n-3 PUFAs in relation to RA risk is shown in table 3. Comparing 1987 and 1997 questionnaires, 61% of women remained in the same category of long-chain n-3 PUFA intake and 64% in the same category of fish consumption. Women with consistently high intake of >0.21 g/day of dietary long-chain n-3 PUFAs in both 1987 and 1997 had a statistically significant 52% (95% CI 29 to 67%) decrease in RA risk compared with women who reported a lower intake in both years. We also evaluated the relationship between long-term fish consumption and RA: a consumption of one or more servings of fish per week was associated with a 29% decrease in risk (RR 0.71; 95% CI 0.48 to 1.04). To examine if the inverse association between long-term fish consumption and risk of RA can be attributed to its content of dietary long-chain n-3 PUFAs, we additionally adjusted the model for dietary long-chain n-3 PUFAs. Indeed, the inverse association disappeared (RR for fish ≥1 serving/week 1.14; 95% CI 0.70 to 1.87). In this prospective cohort study of middle-aged and older women, we observed a statistically significant inverse association between intake of dietary long-chain n-3 PUFAs and RA. Long-term consistently high intake in both 1987 and 1997 of >0.21 g/day (corresponding to at least one serving per week of fatty fish (eg, salmon) or four servings per week of lean fish (eg, cod)) was associated with a 52% decrease in risk of RA. Consistent long-term consumption of total fish once or more per week was associated with a 29% decreased risk. The inverse association between fish consumption and RA can be attributed mainly to its content of long-chain n-3 PUFAs. Similar to our results, a statistically significant threshold effect was observed at a long-chain n-3 PUFA intake of 0.25 g/day in a pooled analysis of prospective studies and randomised trials that studied the relationship between intake of fish and fish oil and the risk of death from coronary heart disease.24 That study, together with others showing beneficial effects of long-chain n-3 PUFA intake on cardiovascular disease25 and during pregnancy,26 has been reviewed by the American Dietary Guidelines Advisory Committee. On the basis of that review,27 Americans were advised to eat fish twice a week, a recommendation that is also in line with our finding. The threshold effect found in this and other studies imply that a moderate consumption of fish is sufficient to reduce risk of diseases. The main strength of the present study is its prospective population-based design, in which the ascertainment of the exposure was independent of the ascertainment of the outcome. Therefore, this study was not affected by recall bias. Moreover, the assessment of the exposure in 1987 and 1997 (6 years before the start of follow-up) prevented possible differential misclassification of exposure due to a change in diet related to pre-symptoms of the disease. It also allowed analyses of long-term intake. The use of a self-administered questionnaire to assess diet could have been a possible source of non-differential misclassification of the exposure, since it is possible that women could have over- (or under-) reported their fish consumption. However, the fairly high validity of our estimated intake indicates that the FFQ provided a reliable assessment of long-chain n-3 PUFA intake. We used data from three Swedish registers to assess RA diagnosis, but the use of these registers required some attention. The SRR has limited coverage in the study area, and data were not sufficient to allow the use of this register as the only source of case identification. The Outpatient Register was only started in 2001. During the first few years, this register caught for the first time patients who had a diagnosis of RA before 2001 (see online supplementary appendix, figure App-1). For this reason, we decided to postpone the start of follow-up to January 2003. In sensitivity analyses, since in 2003 some prevalent cases still might have been defined as new cases, leading to bias, we also considered January 2004 and January 2006 as alternative starts of follow-up. Moreover, we considered the inclusion of data on patients with newly diagnosed RA from the Inpatient Register. These cases were considered prevalent and therefore excluded from the main analysis because RA is not a disease that leads to hospitalisation in the early stages. Results from these sensitivity analyses were very similar to those from the main analysis (see online supplementary appendix, table A). A possible source of misclassification in this study might be the inclusion in the analysis of prevalent cases as newly diagnosed RA cases. We evaluated this possibility through simulation, and results were consistent with the main analysis (see online supplementary appendix, table B). We observed a lack of association between use of fish oil supplements and risk of RA, but the number of cases in which fish oil supplements were used was limited (n=17). Moreover, we did not have any information about dose and duration of supplement use to fully evaluate their association with RA development. As additional limitations, we did not have any information to allow us to examine the association among men and premenopausal women and to stratify for presence of anti-citrullinated protein antibodies. Moreover, we only had two observations to evaluate the long-term intake of long-chain n-3 PUFAs. In conclusion, the study indicates a potentially important role for dietary long-chain n-3 PUFAs in the aetiology of RA, and that adherence to existing dietary guidelines regarding fish consumption may also be beneficial in terms of RA risk.
. Nationwide prevalence of rheumatoid arthritis and penetration of disease-modifying drugs in Sweden. Ann Rheum Dis 2011;70:624–9.
. Long term alcohol intake and risk of rheumatoid arthritis in women: a population based cohort study. BMJ 2012;345:e4230.
. Fatty acids from fish: the anti-inflammatory potential of long-chain omega-3 fatty acids. Nutr Rev 2010;68:280–9.
. Omega-3 fatty acids in rheumatoid arthritis: an overview. Semin Arthritis Rheum 1998;27:366–70.
. Fish oil and rheumatoid arthritis: past, present and future. Proc Nutr Soc 2010;69:316–23.
. Diet and rheumatoid arthritis in women: a possible protective effect of fish consumption. Epidemiology 1996;7:256–63.
. Dietary factors in relation to rheumatoid arthritis: a role for olive oil and cooked vegetables? Am J Clin Nutr 1999;70:1077–82.
. The effect of olive oil and fish consumption on rheumatoid arthritis—a case control study. Scand J Rheumatol 1991;20:419–26.
. Diet and risk of rheumatoid arthritis in a prospective cohort. J Rheumatol 2005;32:1249–52.
. Dietary fish and fish oil and the risk of rheumatoid arthritis. Epidemiology 2009;20:896–901.
. Protein, iron, and meat consumption and risk for rheumatoid arthritis: a prospective cohort study. Arthritis Res Ther 2007;9:R16.
. Diet-associated risks of disease and self-reported food consumption: how shall we treat partial nonresponse in a food frequency questionnaire? Nutr Cancer 2000;36:1–6.
. The food composition database KOST: the National Administration's information system for nutritive values of food. Vår Föda 1991;43:439–47.
. Total energy intake: implications for epidemiologic analyses. Am J Epidemiol 1986;124:17–27.
. Effect of additional questions about fat on the validity of fat estimates from a food frequency questionnaire. Study Group of MRS SWEA. Eur J Clin Nutr 1998;52:186–92.
. The validity of questionnaire-based micronutrient intake estimates is increased by including dietary supplement use in Swedish men. J Nutr 2004;134:1800–5.
. Increased risk of autoimmune disease in families with Wegener's granulomatosis. J Rheumatol 2010;37:2553–8.
. Time-to-event analysis of longitudinal follow-up of a survey: choice of the time-scale. Am J Epidemiol 1997;145:72–80.
. Choice of time-scale in Cox's model analysis of epidemiologic cohort data: a simulation study. Stat Med 2004;23:3803–20.
. Partial residuals for the proportional hazards regression model. Biometrika 1982;69:239–41.
. Fish intake, contaminants, and human health: evaluating the risks and the benefits. JAMA 2006;296:1885–99.
. Healthy fish consumption and reduced mercury exposure: counseling women in their reproductive years. Can Fam Physician 2011;57:26–30.
. Omega-3 fatty acids and cardiovascular disease risk: do we understand the relationship? Physiol Res 2009;58(Suppl 1):S19–26. DGAC. Report of the Dietary Guidelines Advisory Committee on the Dietary Guidelines for Americans, 2010, to the Secretary of Agriculture and the Secretary of Health and Human Services: U.S. Department of Agriculture, Agricultural Research Service, Washington, DC, 2010. Contributors DDG, AWa, MB, JA and AWo participated in the study design and writing the manuscript. DDG, AWa and AWo participated in the data collection. DDG analysed the data and wrote the manuscript under the supervision of AW. DDG, AWa, MB, JA and AWo interpreted the data and critically reviewed the paper. AWo is the guarantor of the study. All authors read and approved the final manuscript. Funding The study was supported by research grants from the Swedish Research Council/Committee for Research Infrastructure for maintenance of the Swedish Mammography Cohort, and from the Karolinska Institutet's Award for PhD students (KID-funding). Ethics approval Regional Research Ethics Board at Karolinska Institutet.